Honeymelon, also known as honeydew, is a member of the muskmelon family (Cucumis melo), which also includes casaba, crenshaw, and cucumber. The honeymelon is circular or slightly oblong shaped and 15-22cm in diameter. The fruit has green-yellow skin, with a pale green flesh that contains seeds in the middle. The ripe flesh and juice are sweet and flavorful, perfect to be eaten on its own, juiced, added to salads or to make sorbet. Honeymelon is a summer fruit and must not be mistaken with wintermelon. It is a refreshing treat in summer due to its natural cooling effect on the palate. Honeymelon is loaded with in essential nutrients that help fight and prevent many diseases and is a perfect choice for improving your health. This melon is an excellent source of vitamin C and the B vitamins; as well as essential minerals such as potassium, calcium, phosphorus, zinc, iron and copper. 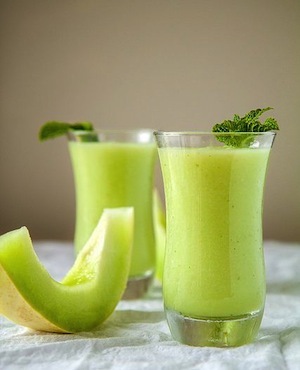 It is very low in calories and contain a small amount of natural sodium which gives the melon a rather unique sweet and salty flavor. Cholesterol: This fruit contains a high amount of soluble fiber that helps reduce the level of cholesterol in the body. Bone and Teeth Strength: Honeydew is rich in calcium, which is beneficial for healthy bones and strong teeth. Hydration: Honeydew contains a substantial amount of useful minerals, such as potassium, that aid in sustaining water level in the body. It is made up of approximately 90 percent water, therefore, is a good source for quenching thirst and hydration at cellular level. Honey melon aids digestion: Its insoluble fiber is essential for digestion. Eating honeymelon or drinking of its juices helps relieve constipation and other digestive issues. Honeywdew relieves hypertension: Honeydew is great for individuals suffering from hypertension as this fruit is rich in potassium, an essential mineral that counteracts the blood-elevation effects of table salt. Immunity: Studies show that a single serving of honeymelon contains 34 percent of the daily needed dosage of vitamin C that is essential for building a strong immune system. Pregnancy: Women need more nutrients during pregnancy for fetal growth. Many of these nutrients are found in honeydew melons; making it an ideal food for mothers-to-be. Eat honeymelon for healthier, younger looking skin.The vitamin C content of honeymelon improves the levels of collagen in the body. Collagen plays a vital role in strengthening the blood vessels and skin tissues. Lack of collagen can cause wrinkles and sagging skin. Vision: Honeydew is packed with lutein and zeaxanthin, important phytonutrients for healthy eyes. Having enough amount of this compound will help reduce risk for cataracts and other eye conditions. Water Retention: Like watermelon, the superb hydration quality of honeymelon make the juice an ideal for reducing water retention and edema. 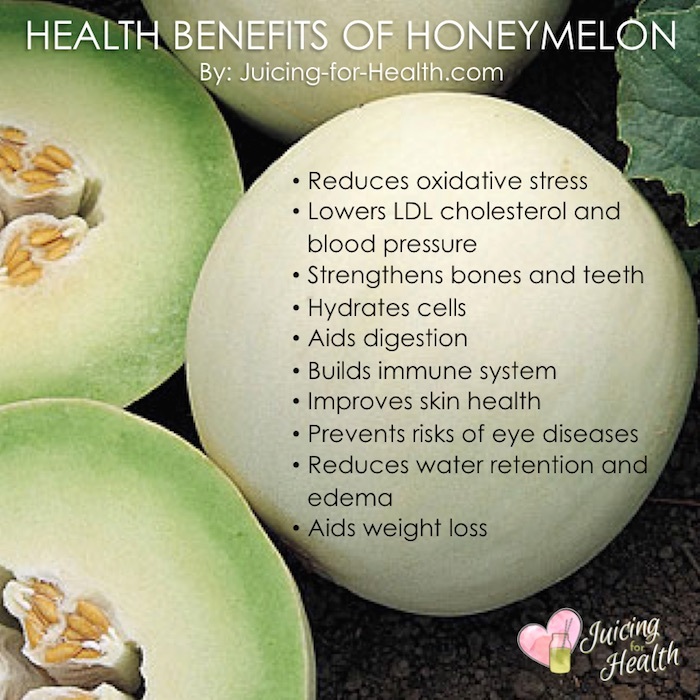 Honeymelon can help with weight loss. Individuals who want to lose weight will find honeymelon juice a great help. The high water content makes it excellent as a diuretic drink that helps cleanse the kidneys and encourage bowel movement for a healthy colon which helps weight loss. Melons grow on the ground so wash thoroughly before cutting to avoid contamination. Honeymelons are in season during the summer months. You can find this nutritious fruit in most supermarkets. 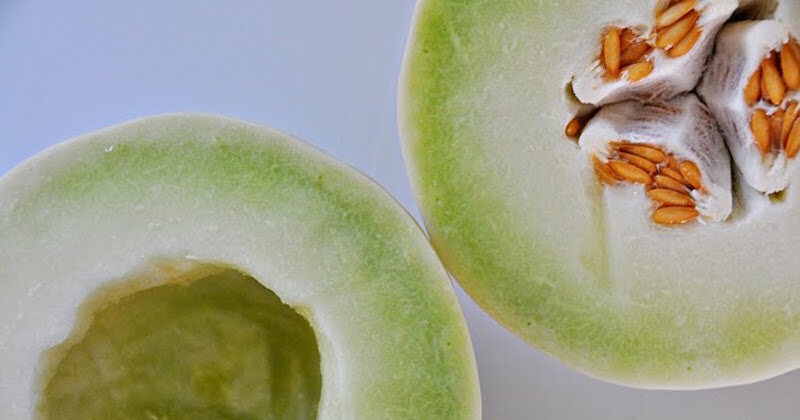 When buying or harvesting, look for mature honeymelon with a creamy yellow colored skin. Mature melons will have a slightly sweet scent.